[CONFSERVER-31518] Page properties report missing content due to nbsp - Create and track feature requests for Atlassian products. When using the content report Macro, and showing specific columns may fail to show the contents of the named column, even if the name of the column is correct. 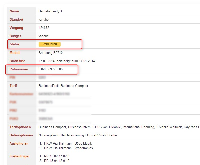 Create the following page in Confluence; and give it a label of "Policies"
Verify the report is shown correctly. In the "Columns to show" field, enter "Authorisation"
Verify that while the column header shows, the content field does not. The content should be shown for this column, but it is blank instead.